After six long years, homebuilders are back in business – literally. New home sales are up 25% year-over-year and 36% from the 2011 bottom. 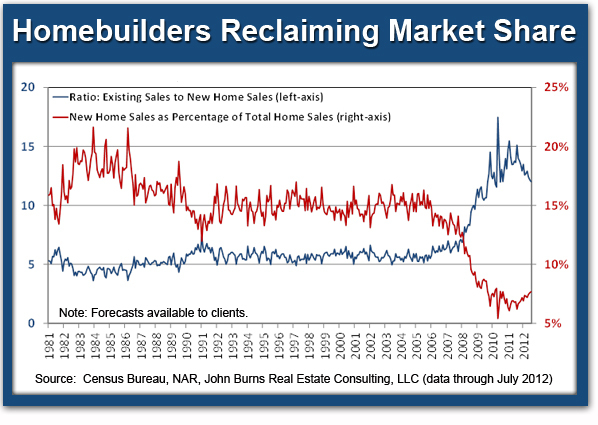 As shown in the chart below, homebuilders are also finally reclaiming market share. During the downturn, new home sales fell from 16% to just 5% of total home sales while the existing sales to new home sales ratio jumped from 5 all the way to 17. Over the last two years, however, both of these metrics have begun to reverse in favor of the new home market. New home sales now account for 8% of the overall market, while the existing sales to new sales ratio has narrowed to 12. Lack of distressed inventory is artificially restraining existing home sales. 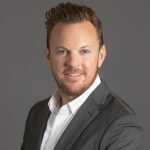 While distressed resale sales are down 9% annually, thanks to sloth-like bank foreclosure departments, traditional resale sales are rising at a solid 18% annual clip not far off the new home sales pace of +25%. Lack of profitable development opportunities could constrain new home sales. Should banks accelerate foreclosure activity, homebuilders may once again find themselves temporarily losing market share. However, in the long-term, we expect new home sales to grow much faster than resale homes, recapturing their 15%+/- market share of all transactions.